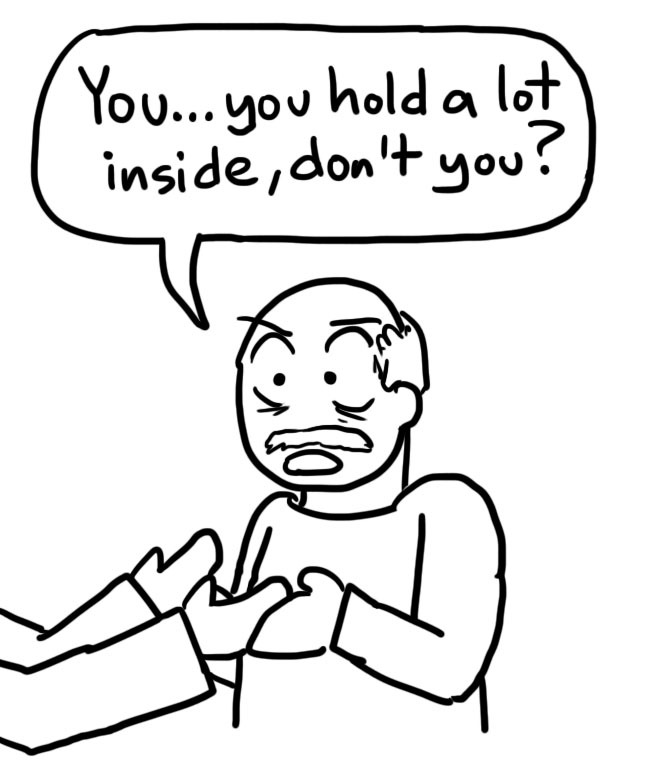 It’s all in the palms (or so they say) | I think in comics. The Pennsylvania Renaissance Faire was having a 2-for-the-price-of-one day, so a couple of friends and I decided to head out to the countryside for a day. 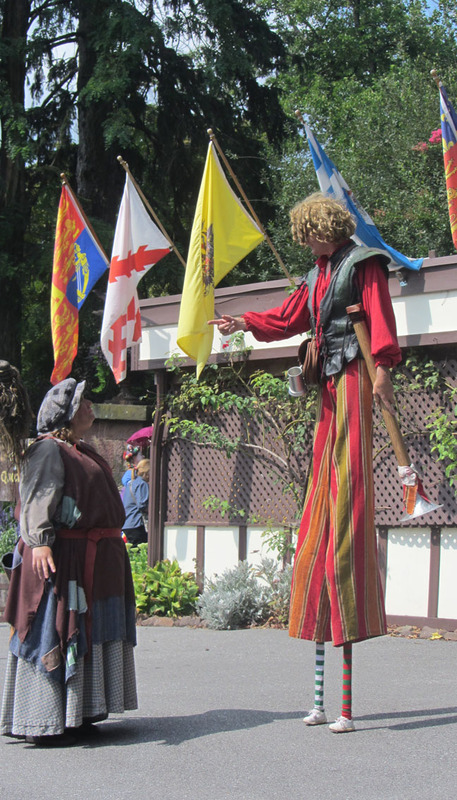 I’ve never been to a Renaissance fair, so I had no idea what to expect. Basically, this little winery/estate is set up to look like a English Renaissance-era village. There are little booths, lots of food, stages, day-long performances. Professional actors roam the streets in full costume. There are “games”– and by “games” I mean getting to throw axes and ninja stars and knives at stuff. So I was thoroughly charmed by the whole affair. And by “charmed,” I mean spazzing with excitement for 8 hours straight and speaking only in a British accent. While at the fair, my friends and I wandered upon a little fortune-telling booth. 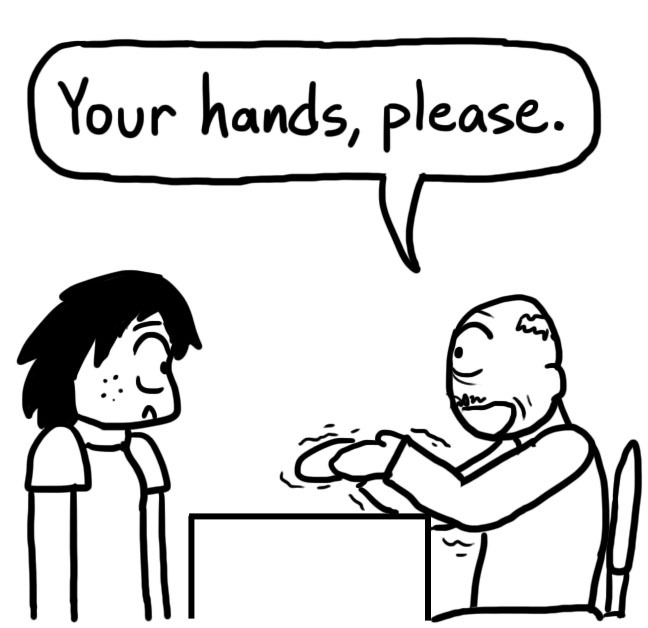 A trained psychic who, for the low, low price of $10, could read your palms for you. For a full $20, he’ll even whip out his tarot cards. I’ve never had my fortune told. I was curious. At the urging of my friend, and with thoughts of this Reasonably Ludicrous Post in mind, I decided to do it. I had to try it just once, right? So I entered the little gazebo the fortune tellers had set up and sat down next to a curiously mustached man. I greeted him. “I’d just like my palms read, please.” He looked at me expectantly, when I realized that this was the time to pull out my wallet. Fee paid, the fun began. Uh-oh. He was losing it. He decided to take make a risky guess. This had me listening. 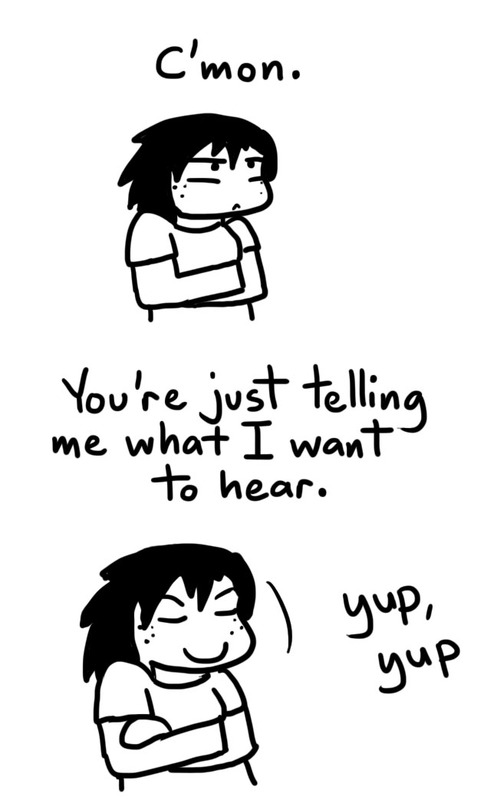 I’m pretty introverted, I admit. He noted my interest, and, encouraged, made an aim for the dramatic. I was obviously getting all sorts of revelations out of this reading. The psychic decided it was time for a final stab to mystify me. Huh. Maybe I’m just too cynical for this kind of thing. The guy had some pretty good hits along with his misses– I’ll give him that. And it was quality entertainment for the ten minutes I was there. Can’t knock it ’til you try it, right? 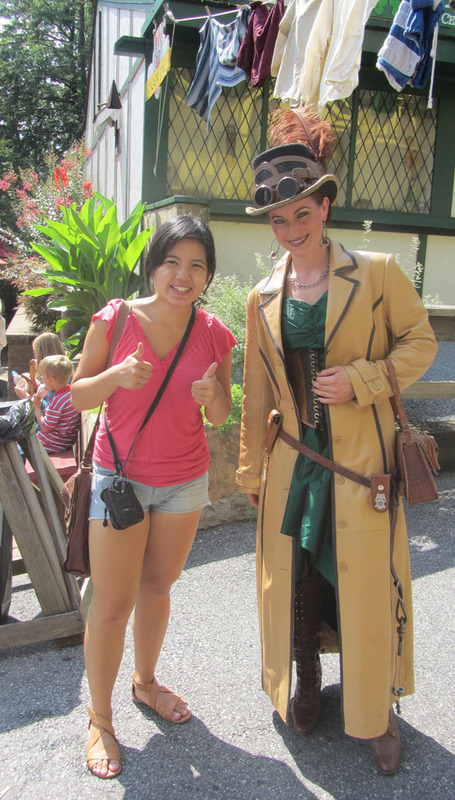 On the other hand, maybe I should have just saved my money to buy a nice steampunk outfit someday. Also, one of my hilariously witty friends has started a blog! Go check her out at One Bright Pearl— I swear her crazy stories never run out. Hahaha, I love that kinda stuff. That was my first ever palm reading, but IT WAS THE REN FAIRE! WHY NOT? He told me my aura was the color white, which is the best it could be. I was alright with that. Oh, and I’m going to have 8 kids. But since that includes pets, that makes sense. I will definitely be an animal hoarder one day. I will own. ALL the hypoallergenic cats. And then be happy forever. The fortune telling was so worth it! Quality entertainment, and even a blog post out of it, to boot. At the Ren Fair, why not? THAT’S EXACTLY WHAT MY FRIEND AND I WERE THINKING. 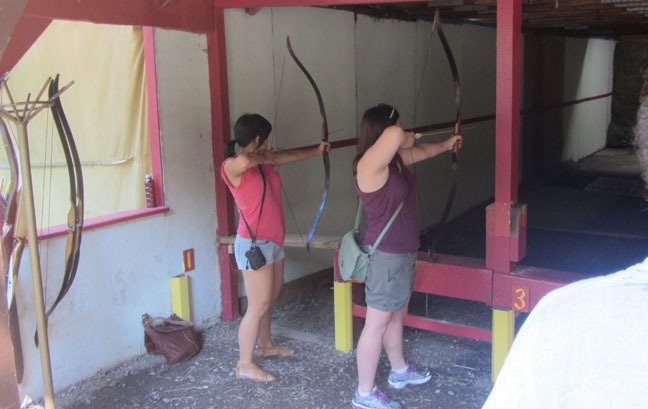 We decided that it was training the the Hunger Games, which we would inevitably win due to our badass archery skills. Not even a problem. Like a boss, Vy. Like a boss. Yeah, there’s no way any of that palmistry works. But it was definitely entertaining!